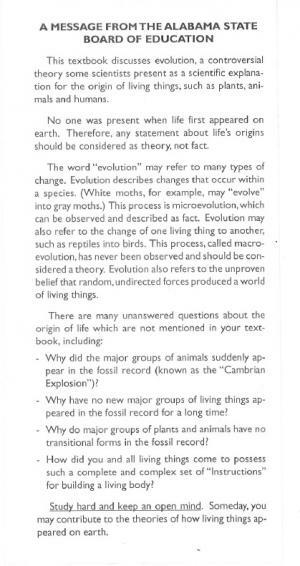 When the Alabama state board of education voted to approve a new set of science standards on September 10, 2015, in which evolution was described—correctly—as “substantiated with much direct and indirect evidence,” I immediately wondered what would become of the evolution disclaimers that textbooks in the state have been required to carry through the last nineteen years. There have been three versions of the disclaimer, in 1996, 2001, and 2005. The 1996 version (right) was the most egregious, describing evolution as “a controversial theory some scientists present as a scientific explanation for the origin of living things.” There was a fair amount of coverage of the prospective fate of the disclaimer, including articles in the Washington Post and Newsweek, but I didn’t see anything about the genesis—if you will—of the original disclaimer. “Monkey Business” contains the full text of the disclaimer, describing it as “pernicious”; surely Anderson would have read the article he cited. So it’s hard to avoid the conclusion that Anderson was intentionally misrepresenting Scott when he omitted the words from her sentence, making it seem as though she were advocating rather than describing philosophical naturalism. On the other hand, Casey Luskin, currently a staff member at the Discovery Institute’s Center for Science and Culture, the de facto institutional headquarters of “intelligent design” creationism, may have simply copied it mindlessly from Anderson when he included it in a collection of “Philosophy quotes” on the website of the Intelligent Design and Evolution Awareness Center, a side project of his which appears to have become moribund by late 2008.